Mid-Century Modern Murano vase with amorphous shape in gradient smoked grey glass. 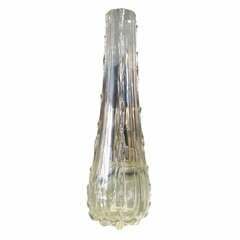 Vase has sculptural organic design with pinched, or pulled ruffled glass throughout the body. Hand blown and gorgeous from every angle. 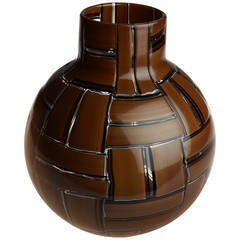 Striking Mid-century modern handblown vase with organic form. 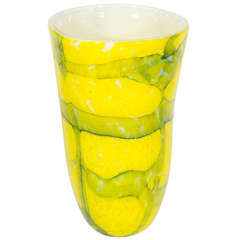 Cased glass in vibrant yellow with murrine streaks in hues of teal, and with white interior. 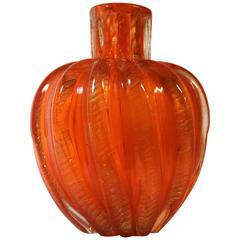 Offered for sale is a spectacular handblown Barovier & Toso orange Murano Glass Vase. The vase is signed on the base and retains the original label. Nice and elegant and early Murano vase. Similar sample in Venetian art glass, an American collection page 114-115. Offered for sale is a fabulous handblown Barovier & Toso multi-color Murano glass vase. This spectacular work of art is signed on the base and retains all of the original labels. "Barbarico" vase by Barovier & Toso Bird vase with extraordinary surface texture. Etched signature. Model designed 1951 Perfect condition. 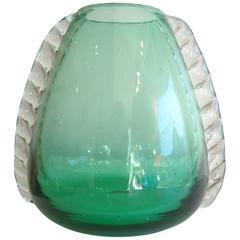 Ercole Barovier Toso Italian Murano art glass vase.